Are you a thriller author? A thriller reader? Both? Then you won’t want to miss the premier conference for thriller writers and fans on the planet! 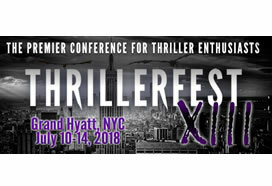 ThrillerFest XIII promises to be the biggest and best event ever! More than 2,000 published and aspiring romance writers, editors, agents, and other industry professionals convene in Denver, Colorado. More than 100 workshops; get the inside track at panels and round-tables featuring publishing professionals; schedule a one-on-one pitch meeting with an acquiring editor or literary agent; and be a part of RWA’s “Readers for Life” charity book signing. This autographing event is open to the public. RomCon® is a FAN convention for romance readers who love romance and we aren’t shy about it. Every year 20-30 NYT and USA Today Bestselling authors and 60-70 exciting newcomers spend a weekend of one-on-one interaction with their fans. Author Lori Foster is the keynote speaker.